Thanks so much for sharing, Rep. Akin. This is an old issue that has crawled back out from under a rock. The Atlantic has a good rundown. And Newsweek doesn't have a fact-checking department? Huh. Anyway... and what's up with all the Edward/Wallis Simpson love at Pinterest? These people were fascist sympathizers, I don't care if they were stylish. And from all accounts, Edward was none too bright. Sheesh. I need to go find some more pleasant stuff to post, right? I'll be back later. If I feel like it. 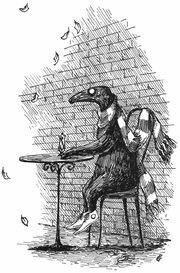 Here's a lovely Edward Gorey drawing for you, from The Doubtful Guest. Isn't he perfect?